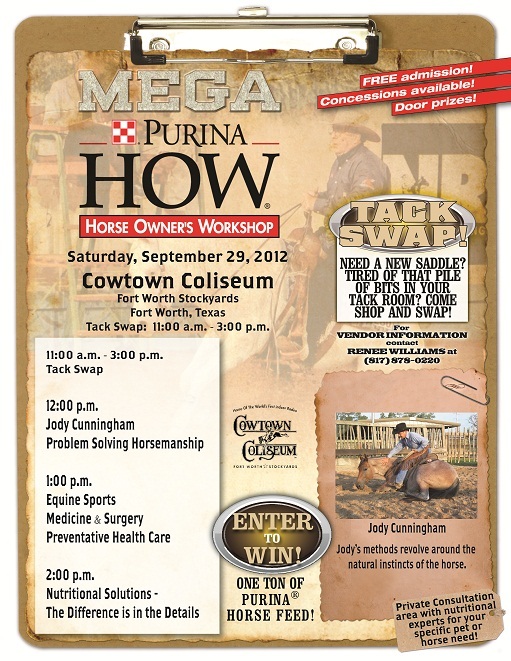 Russell Feed is excited to promote Purina’s Horse Owner’s Workshop on September 29th at the Cowtown Coliseum! This is a great event for all horse owners and lovers! In combination with the annual Tack Swap, come hear from the experts on nutritional solutions for your horse, problem solving horsemanship, and the latest in equine preventative health care. The tack swap is from 11:00 am to 3:00pm. Have items in your barn and tack room that you’d like to sell? Give Renee Williams a call at 817-878-0220 to reserve your spot! This entry was posted on Thursday, August 23rd, 2012 at 10:29 am	and is filed under Events, News & Updates. You can follow any responses to this entry through the RSS 2.0 feed. Both comments and pings are currently closed.